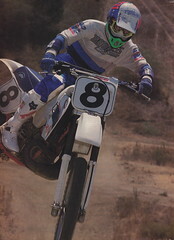 Time for another classic race from my Supercross VHS collection. This one is from 1988 and is from Tampa. In 1988, Ricky Johnson was coming off of an up-and-down season where he had dominated much of the racing but still lost the ’87 Supercross title due to a crash and DNF at Anaheim. In 1988, he was out for redemption and aimed to get back the number one that Jeff Ward had wrested from him the year before.